This Bible belonged to, and was presumably made for, Robert de Bello (i.e. 'of Battle', near Hastings), who was abbot of the Benedictine abbey of St. Augustine, Canterbury, from 1224-53. He was clearly concerned to have an accurate text--it has been corrected carefully throughout--and his influence may be responsible for some of the very unusual imagery included among the initials. 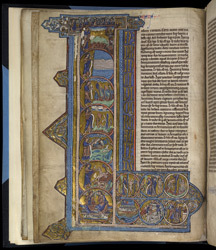 At the very top of this historiated initial 'L' are the nine orders of angels; in the seven large roundels are the Fall of the Rebel Angels and the Creation, and the Trinity enthroned; and in the six smaller roundels are scenes of Adam and Eve, Noah's Ark, the Tower of Babel, and the Sacrifice of Isaac. Many of the most memorable events of Genesis are therefore summed up in this initial.